WASHINGTON (CNN) -- Over the last several weeks a growing number of al Qaeda operatives have entered Yemen from Saudi Arabia and have established a renewed network that potentially threatens U.S. and Saudi targets in the region, both U.S. and Yemeni officials have told CNN. 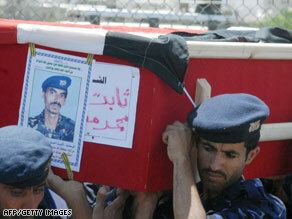 Yemeni soldiers carry the coffin of a comrade killed in September's attack on the U.S. Embassy. As a result Yemeni security forces have gone on high alert. CNN spoke with three U.S. officials and a Yemeni embassy official who outlined new concerns about al Qaeda in Yemen that all three said go beyond the usual worries about the terror organization in Yemen. None of the officials could be identified by name because of the sensitivity of the information. "There are strong indications of heightened activity in Yemen," one U.S. official told CNN. "There is real concern in the U.S. government that al Qaeda is trying to mount attacks in Yemen." The United States continues to worry about attacks against the U.S. embassy or other U.S. business interests in Yemen the official said. But there are also growing concerns that a renewed al Qaeda network in Yemen could plan attacks against Saudi oil infrastructure or the massive cargo shipping operations that run through the immediate region -- potentially disrupting an already shaky world economy. The official said there is a flow of intelligence information in recent weeks backing up that assessment. "There are clear indications al Qaeda is placing emphasis on Yemen as a place to conduct operations and train operatives." Both U.S. officials said one of the major concerns is that a number of al Qaeda operatives have crossed the border from Saudi Arabia since a Saudi crackdown has stepped up. Al Qaeda, he said appears to be looking for a new place in the immediate area where it can still operate. The officials could not say how many have operatives may have crossed but the second U.S. official said the United States has been watching closely and is seeing 'gatherings' of al Qaeda operatives and communication among them. There have also been signs of communication between al Qaeda in Yemen and the al Qaeda leadership believed to be hiding in Pakistan, the first official said. For its part, 1,000 troops from the Yemeni border guard were put on high alert last week, according to a Yemeni embassy official. "Additional guard have been mobilized to prevent the movement of wanted elements from and to the Yemeni-Saudi border, " the official said. More than 30 people have already been arrested, he said, and the government of Yemen is developing a new list of "most wanted" fugitives that will be distributed throughout the country. The Yemenis have been anxious to demonstrate to Washington they are serious about cracking down on al Qaeda but the weak central government remains cautious about pressing its tribal leaders. The U.S. officials said the latest concerns about Yemen are not directly related to the emergence of Said Ali al-Shiri as the new deputy leader of Al Qaeda in Yemen. Al-Shiri was released from U.S. custody in Guantanamo Bay but is now back in Yemen. All of this comes as Saudi Arabia has publicly released a list of 85 terrorists suspects -- some of whom are suspected of being in Yemen already. The U.S. State Department has long warned American citizens about the security risk of traveling to Yemen. Last year armed gunmen attacked the U.S. embassy killing 10 Yemeni police and civilians.